People who want to see Pope Francis in Philadelphia next September — or attend the World Meeting of Families, or both — can join travel groups from Wichita or Omaha, Neb. 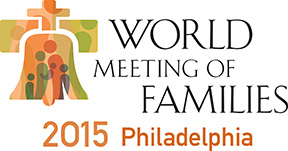 Pope Francis announced Nov. 17 that he would attend the World Meeting of Families in Philadelphia, which is Sept. 22-25, then celebrate Mass for as many as 2 million people on Sept. 27. No other dates or cities have been announced for the papal visit, although he has been invited to Washington, D.C., and New York. Travel agencies have put together packages for the Diocese of Wichita and the Archdiocese of Omaha, and they have invited people in the Salina Diocese to join them. • The Wichita package flies participants to Philadelphia for the World Meeting of Families and the papal Mass for a total cost of $2,600, double hotel room occupancy. It departs Sept. 21 and returns Sept. 28. The price includes the $325 full package registration cost of the World Meeting of Families, as well as airfare, local transportation, hotel rooms, some meals and other activities. The deadline to register for the Wichita trip is Dec. 15. A non-refundable $250 deposit is required. Reservations are on a first-come, first-served basis. There is no reservation without a deposit. To register, go to catholicdioceseofwichita.org/mfl/events/world-meeting-of-families-2015. The registration form and deposit are payable to Grand View Tours in Aston, Pa.
• The Omaha package takes participants by bus but does not include the World Meeting of Families. It will take people to the papal Mass, as well as provide two days of tours of sites in the Philadelphia area. The tour leaves Omaha on Sept. 23 and returns Sept. 28. The cost is $999 for an adult, double hotel room occupancy, or $799 for children 11 and younger. The cost includes transportation, some meals, hotel rooms and the tourist sites. To register, call Legacy Tour and Travel in Fort Dodge, Iowa, at (877) 776-1700 between 8 a.m. and 5 p.m. weekdays. A $200 deposit is required. Legacy Tour also is planning a longer bus trip taking in both the World Meeting of Families and the papal Mass, as well as a shorter bus trip for youth wanting to attend only the papal Mass. Details have not been released. For more information or assistance, contact Reg and Jan Konrade, directors of the Office of Family Life / NFP for the Salina Diocese, at (785) 827-8746, ext. 40, or familylife@salinadiocese.org .